Is there an artefact or is the ice in Kara and Laptev "thickening"? Look at the color change between those days, the 10-15. I don't see it LMV; at least, I don't see anything that stands out enough to my eye to consider it significant. Jdallen: the ice color change from a green tone to a more yellow one, which should imply a thickening of the ice. This is more visible for the 14-15th in the sequence. As DrTskoul says, it could be due to cloud effects which seems likely as I have hard to see that the ice would thicken that much over a few days. Of course, maybe compaction and strong winds might do the trick but doesn't seem likely. The ECMWF has entered into loop mode and predicts for day 10 another bomb storm entering the Barents and displaying similar circulation to the current one about to mess things up. Everything can change but worth keeping an eye. 956mb over brittle ,thin ice??? Surely this cannot be a good start to the season! Temps may not be melt season temps but the lowest of the winter temps are now behind us so the ice will be starting to warm up along with the rest of the basin. My concerns are that we have changed from a system where we had 'down time' over winter ( and could leave the forum until melt season began) to a system where winter is more important than the weathers over summer? If we see another dreadful summer for melt yet see ice finish in the bottom three then will it not signal we have flipped into a very different beastie over the Arctic Basin? You have to remember also what that warmer water in the Barents is capable of doing when it gets disturbed. It has been building back up, waiting to get moved around again. BTW, here is a look at SMOS. I wouldn't count with that 956mb low... just mentioned to keep an eye. It is still in fantasy-land. Peobably the general circulation will hold though. I think this melt season will be the lowest on record. My head tells me it will easily break the record but then when i read all your posts on things i cant even begin to understand i feel a slight break of the record will happen. Maybe the mins will just get slightly lower each year for a decade or so. Look how tight the Isobars are over the Fram! Weather-forecast.com says conditions favourable for export for next 4 to 6 days. Not surprisingly, ice drift estimate for tomorrow, Mar 17. There are also strong 15 - 18 m/s winds east of Svalbard, so export in two places. That big floe turning the corner seems to move a longer distance from 14 to 15 than from 13 to 14. I wonder if that is an artifact of the images or is it actual acceleration of the floe. Meanwhile, the heat is on... cci-reanalyzer shows the lowest anomaly to be reached for the Arctic in its current forecast window is +2.8C. This is especially true near Novaya Zemlya, over the Kara Sea temperatures look to be frequently above freezing and not really getting much below. So ice pumping down the Fram and heat pumping up the eastern Atlantic side... Perfect conditions for the start of spring. The ol' insolation batteries got charged a little too well. I look for it to happen again in the Arctic later this year to a greater degree than last year. You can already see the heat building in the oceans surrounding the Arctic by looking at the anomalies at high lats. on both sides. Will get worse when more waters are open. What do the failing predictive models have to do with the melting season? That has been moved to another thread already, thanks to Archimid, who is becoming quite a useful contributor on this forum. Latest GFS - maximum anomaly per day until next Friday. FDD (Freezing Degree Days for 80N+) anomaly is now about 1,540 since September (last year it was about 950 at the same time). I guess it's going to 1,600 level next week. My understanding is that the anomaly tends to be higher in winter and less in the summer. Will be interesting to see if it persists at a high level during the summer, would reflect the increased albedo effect of more open water earlier in the season (versus the offsetting increased cloud cover assumed in many of the climate models). My understanding is that the anomaly tends to be higher in winter and less in the summer. Yes, but a persistent 4C+ anomaly through the whole winter is new to the data set. Also summer temperatures are limited by the ice. The anomalies during summer will not be this high until sufficient ice is gone. Could start to happen locally on the periphery, like the Kara Sea, ESS, and Beaufort, if the ice there goes early enough in the season. Would that then set up some significant temperature differentials with the ice covered areas? Right; ice and water together have to have a temperature around 0C; pumping more heat in just turns more of the ice to water. So summer anomalies can't really go up until the ice all melts. For this reason, in the summer, we tend to look more at the 925 hPa (or is it mb? I forget) temperature forecasts, to get a sense of the warmth being transported in. By not looking right at the surface we can see how anomalously warm it is. Thanks for the great responses! Latest GFS (Climate Reanalyzer) is showing even higher max anomalies for Arctic. Warmest areas Laptev, Kara and ESS. Also pressure 963 forecasted near Svalbard and FJL for next Saturday. Of course, it's pretty far, but still worth watching. Shouldn't the title of this thread be "The 2017 Melting Equilibrium Month"? Traditionally we only have a "freezing" and then a "melting" thread each year. YMMV of course, but I reckon the loss of over 200k in two days could reasonably be described as "melting". Mind you this thread was started quite a while ago! Where that intense low is currently sitting and where the ice drift map is showing rapid ice movement, there is nothing resembling true ice pack. All of the ice under this low is highly fragmented and less than 2 meters thick, much of it only 1 meter thick. With warm water intrusion from the Barents, a nearly nonexistent halocline, this summer on the Atlantic side could be horrifying. Unrelenting positive anomalies on the Russian side of the Arctic to March 26th from climate reanalyzer, not good for thickening the ice. Periods of near zero and above in the Kara Sea. 1000hpa warm air intrusion varying between +1oC and +2.2oC. Starting now(left side) progressing in 3 hour intervals, left to right, and top down. Thanks Tigertown, a picture paints a thousand words. Among other places, it looks like there is melting and thinning out of ice within parts of the CAA. With current temps there, I doubt we are seeing any thinning out in CAA. More like the usual thickening-in I'd say. Kara otoh is going south pretty quickly this year. Something changed around the 11th. Maybe that the ice is such slush that it is moving and compacting elsewhere with the wind. As we speak, warm winds have reached to Laptev Sea. Temp +1.1 °C and wind 13 m/s. That is 9:00 UTC according to earth.nullschool. Latest GFS shows higher anomalies for Arctic persist (numbers are now average per day). Warmest areas Laptev, Kara and ESS. Kara and Laptev seem to be constantly "warm" until next Sunday. The retreat south of Novaya Zemlya is caused by winds and is bound to continue given the current forecast, with lows stationed over the Siberian side of the Arctic. The Canadian ice service (CIS) shows mostly old ice and medium FYI in the western CAA. With the eastern CAA showing mostly medium FYI and some old ice showing up in the western edge. The CIS definition of old ice: Sea ice which has survived at least one summer's melt. PS I can't seem to figure out how to capture the image. The U.S. CFS model, the long range extension of the GFS predicts this atmospheric circulation pattern will continue through the spring so that north Siberian temperatures will average well above normal for months. Apparently, the ocean heat patterns are driving this general circulation pattern. 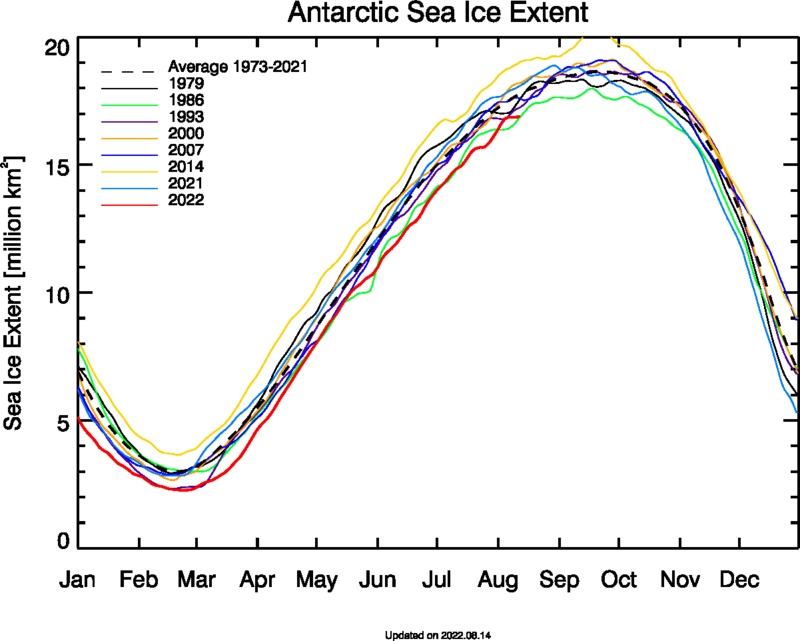 This portends a catastrophic summer for sea ice and Siberian permafrost. Eastern continental Europe....+....northwestern Russia has had a warm spring. Someone else has already made posts of the German drought this winter and spring. The risk of SIGNIFICANT wildfires in northern Russia and especially northwestern Russia (including Moscow) is there are waiting. The conditions are ripe.....now all that is needed is the right (wrong) weather patterns. Additional wildfires.....like those in 2010.....is going to feed the already ravenous feedback effects. We continue to take the "next step" into what everyone here KNEW is happening. The only thing we don't know each year is (1) where is it going to be bad this year, and (2) how bad is bad going to be THIS YEAR? Arctic ice likely heading for a new record low. How low? Is it going to be 5% below the 2012 record....or 15% below the prior record low? Next decade likely to be "eye-popping" on several fronts: Ice, temps, wildfires, etc. The next week along the northern Russian coast could be an opening dagger for the ice melt season this year. Nighttime temps in Russia are remaining high.....with a continued lack of "new record low temps". The new record high temps haven't been incredibly high.....it's the LACK of new record low temps....they are becoming an endangered species. Russia has 2 (two) new record low temps in the country so far this month. They have 5 months THIS DECADE when they have had 10 or fewer new record low daily temps for any single month....and those have come over the last 40 months. The entire decade of 2000 - 2009 had only 2 instances where a single month had 10 or few new record low temps. Going to be a crazy climate year....and a crazy climate decade. Just make sure you remind people who has been lying over the past 10 - 30 years as this continues to unfold. The atmosphere is efficiently removing the cold air from the Arctic and eliminating the cold by ramming it over the northwest Pacific and the NW Atlantic. This has happened because the Pacific decadal oscillation has shifted to the warm phase and the overturning circulation in the north Atlantic has gone into its more active mode. This PDO (or IPO) pattern expands the jet stream southward over the Pacific ocean. It also brings more heat from the Atlantic to central and northern Europe. This all adds up to a warm early spring for northern Eurasia. And once in place it will be amplified by early snow loss and increasing heat uptake by the bare ground and open ocean. Yes, expect a bad fire season in Russia and Siberia to start early and for the soot to amplify the rate of snow melt and ice loss. Here are a few panels showing what I described above from ECMWF model forecast of the circulation and temperature patterns the next 10 days. Thanks to Levi at Tropicaltidbits.com. Note the general aspects of the circulation pattern will continue all spring if the Euro and American models are getting it right. And I'm pretty sure they are because they are picking up something huge - a strong jet stream and extreme ocean heat in the north Atlantic and subpolar seas. As has been pointed out by others care has to be taken when interpreting the AMSR charts. Talking about "slush" there has no credibility. Again the appearance of lowered ice concentration coincides with clouds. I can't seem to figure out how to capture the image. Thanks Jim I'll give that a go next I post. Ok, slush was probably an overstatement. However, the shape that the ice is in for this time of year has made it more mobile and at the whim of wind and current. When it compacts in one place, the concentration goes down in another. I don't recall saying anything about open water. The concentration went down by a percentage*, which I am sure many including myself thought to be worth mentioning. It shouldn't do that so easily right now. It simply isn't going to hold together once it really comes under any pressure, and then it will be "slush." * In that one area after the 10th of the month, lasting until the current date. I wonder if enhanced Siberian snowcover is playing a part in this? Vastly more open Arctic Ocean = +++Siberian snowfall, but even when we see temps average much colder than normal over parts of the region as we did last fall, that is derived from anomalously *early* snowcover and not radiative cooling. Perhaps the feedback resulting in increasing NHEM autumnal snowcover (especially in Eurasia) contributes directly to the ++++anomalies seen over Siberia during spring/summer normally? The insulating and anomalously thick snowpack must mitigate the ability of permafrost to reform, perhaps locking in some of the heat accumulated by the ground during summer as well, resulting in a ready-to-bake northern tier of Russia as soon as the snowcover melts in the spring. This would by my thinking too bbr2314? I might even be tempted into thinking that parts of ESS/Kara/Barentsz had some pretty slushy surface conditions over October that may have seeded freezing over summer warmed waters locking that heat in too? If we lose the W.Siberian snow as early as other years then all it will have served to do is rip the vortex off its keel and throw arctic plunges around the lower latitudes emptying the basin of cold for WAA to replace. The first two are the Snow Cover Extent for North America and Eurasia. Notice that they are trending low but within variation. The second two are of the Snow Water Equivalent, which I interpret as the thickness of the snow pack. Notice that is trending very high. Even if there is thicker snow cover, the snow extent favors lower albedo. Page created in 0.064 seconds with 28 queries.